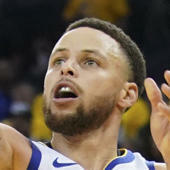 Curry poured in 20 points (8-16 FG, 4-7 3Pt) and added five rebounds, one assist and two steals across 28 minutes in the Trail Blazers' 126-118 win over the Mavericks on Wednesday. With C.J. McCollum (knee) out of action, Curry helped fill the backcourt scoring void with his second 20-point effort of the last six games. Curry has been especially sharp from behind the arc over the first two full games McCollum has missed, as he's connected on seven of 13 attempts from three-point range. The 28-year-old appeared to be battling some rustiness in the earlier portion of this season after missing all of last year with a leg injury, but he seems to be hitting his stride at an especially opportune time of year with six double-digit scoring tallies since the All-Star break.